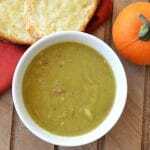 Split pea soup has to be one of my favorite comfort soups! This is our family’s recipe for split pea soup from many years back now when we first bought a pressure cooker. This recipe has been tweaked just a little since then, I no longer put carrots in my split pea soup. I found them unnecessary and the split pea soup still comes out perfect. Can’t argue with that, and it’s easier! The amount of chicken broth in this recipe makes a good in between, not-too-thin soup, but if you like it a little thinner, add more broth when finished. Heat olive oil in instant pot and saute’ split peas, celery, onion, ham and garlic for 5 minutes. Add chicken broth, wine (optional) and spices. Follow Instant Pot instructions for the following: Lock lid in place and set Instant Pot for high pressure for 20 minutes. Quick release pressure when finished. Season to taste with salt and pepper. I love to serve toasted cheese bread along with split pea soup! Cut thick slices of french bread, brush with butter and top with your favorite cheese. Broil until cheese is melted and bubbly.